Have you seen Highways England’s latest considerations for design update on the crossing route? The actual pdf is only a few pages long, but let’s take a look at the main points. 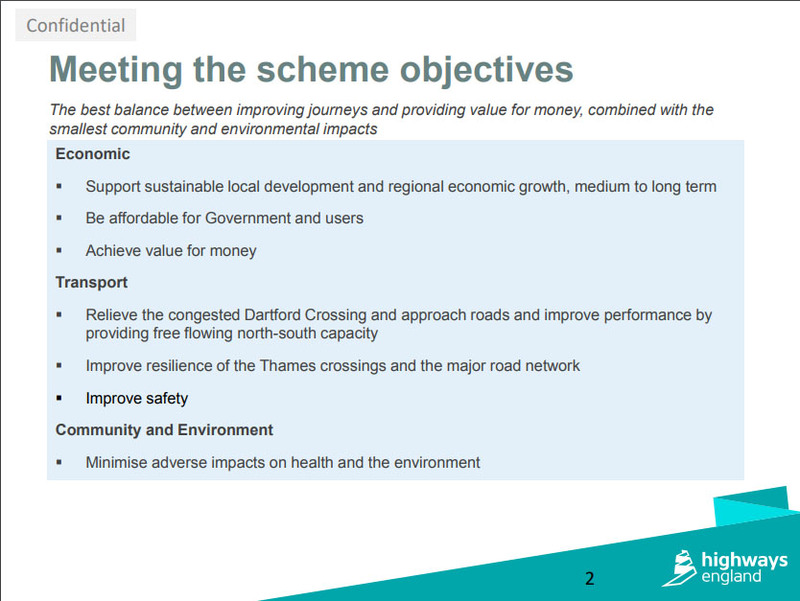 Option C is estimated by Highways England themselves to take only 14% of traffic away from the current crossing, compared to at least 40% that they estimated for Option A14. >>View the HE comparison chart<< That same chart shows that safety would be more improved with Option A14 also. We also know that Option C3 opens up Greenbelt land for development too, impacting communities and the environment, so we’re not sure how they feel this options minimize adverse impact on health and the environment, especially when you take into account the Toxic Triangle it will create. This shows the design update that HE are considering for development. 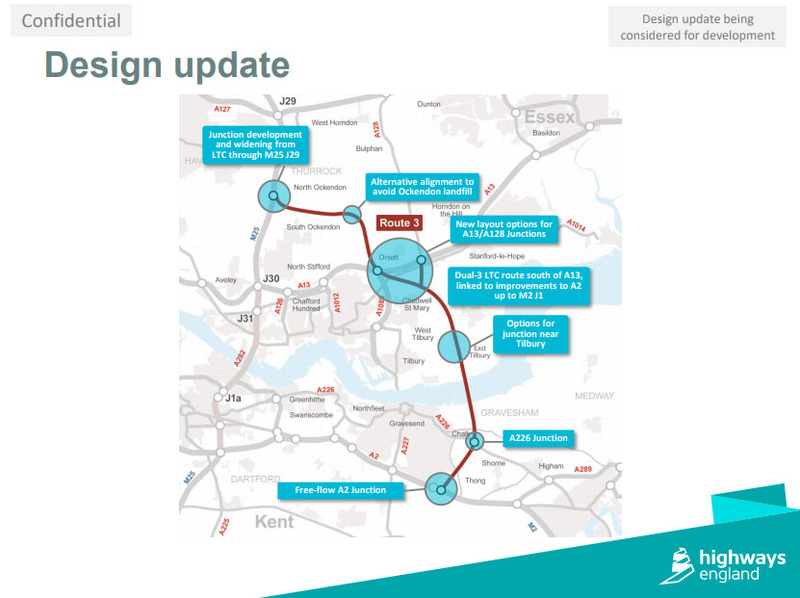 Amongst other, ,note the alternative alignment to avoid Ockendon landfill, new layout options for A13 / A128 junctions, Options for junction near Tilbury. 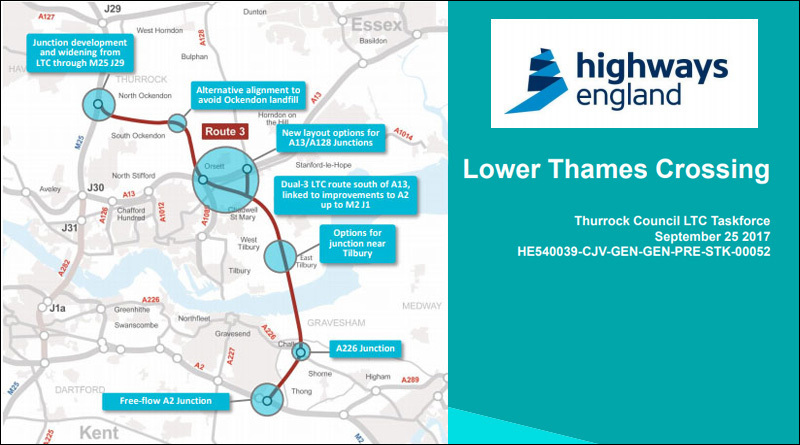 The later appears to be to keep Tilbury Port happy, as they stated in their press release back in April “Port of Tilbury backs Lower Thames Crossing – but only with a junction into the expanding port area“. 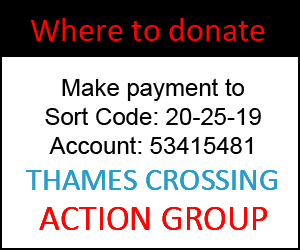 There is also a junction south of the river at the A226 which many that side of the river are unhappy about (see here and here). 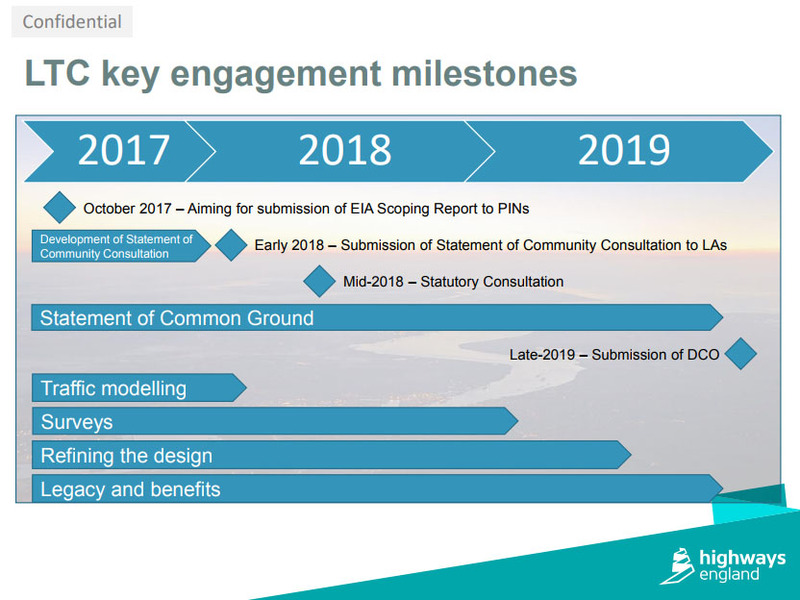 Showing their key milestones, including the Consultation early next year. 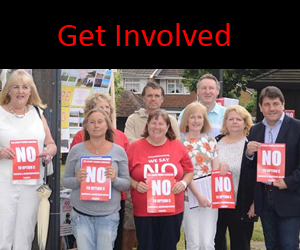 Just a reminder the last consultation in 2016 was an informal one, this will be the formal one in 2018. Unprecedented numbers took part in the informal consultation, we need to ensure even more people know about and are prepared with as much info about the proposed crossing as possible for this formal consultation, as it is important that as many take part in it as possible. Sign up to our newsletter at the top of the page for regular updates, and please keep sharing info and updates with anyone and everyone you can!